Volunteers, members of the public, schools and businesses all got involved to fundraise yesterday on what would have been Margaret Green’s 100th birthday. 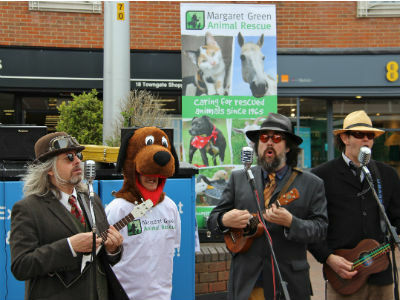 One of the highlights of the day were the Mother Ukers, who performed in Falklands Square outside the Dolphin Shopping Centre in Poole to entertain shoppers and passers-by. The band, who are supporting us as their chosen charity have made a very special video of their song ‘Love Cats’ which you can view here. See if you can spot some of our animals too as the band spent a day filming at Church Knowle earlier this month. Other attractions at The Dolphin Shopping Centre, who are also supporting us this year, included a teddy tombola, pet photographs, foot massages and face painting. 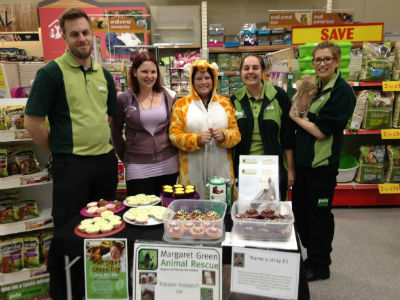 Visitors to Pets at Home Dorchester, Poole and Bournemouth could also get involved and buy a cake for charity and pupils and parents at the Bournemouth Collegiate Preparatory School supported Margaret Green Day by holding a book sale after school. If you would like to make a donation to support us in our 50th anniversary year, please follow this link. If you think your name or the name of your school or business should be on this list, please contact us today by emailing lucy.compton@mgar.org.uk and let us know about your fundraising achievements!